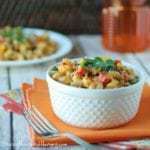 Cheesy, non-dairy mac and cheese with a Mexican kick! Cook noodles until al dente, drain and set aside. In a skillet, heat the olive oil over medium heat, add the veggies and garlic and cook until warmed through and slightly soft. Add the cumin, chili powder, and cayenne and stir to distribute. Combine the vegetable mixture with the pasta, set aside and keep warm on low heat. Melt the butter in a saucepan over medium heat, mix in the milk, then the flour. Combine the cheese mixture with the pasta and veggies and mix well. Pour the mac and cheese into a 9x9 baking dish. Sprinkle with bread crumbs and French fried onions. Cover with foil and bake for 20 minutes, then remove foil and bake for another 20 minutes.